A joint program of the Dwight D. Opperman Institute of Judicial Administration and the N.Y.U. 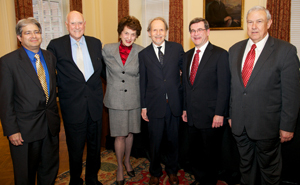 Journal of Legislation and Public Policy marked the fiftieth anniversary of the New York Civil Practice Laws and Rules. The CPLR was adopted by the New York Legislature in 1962 and went into effect on September 1, 1963. Although amended many times since its adoption, the CPLR has remained the primary source of civil procedure rules in New York for the past 50 years. This Symposium looked back and examined both the process that yielded this remarkable statute and the major innovations it brought. We took stock of the principal procedural arrangements effected by the CPLR and looked ahead to future challenges. Speakers included Hon. Jack Weinstein, who was one of the principal architects of the CPLR in his role as Reporter to the Advisory Committee, Hon. Judith Kaye, Prof. William Nelson (NYU School of Law), Prof. Vincent C. Alexander (St. John’s University School of Law) and David L. Ferstendig, Esq., and the program will be moderated by Prof. Oscar G. Chase (NYU School of Law).